As NewsBusters reported earlier, Sunday's episode of HBO's The Newsroom was an absolute disgrace that included numerous attacks on elected members of the Tea Party including a disparaging comparison of Congresswoman Michele Bachmann (R-Minn.) to the late Joe McCarthy. People turning on HBO Sunday evening must have thought they'd accidentally switched channels to MSNBC. The Left's hunt for conservative talk radio host Rush Limbaugh's head stepped up a notch Saturday when Jane Fonda and Gloria Steinem called for the FCC to ban him. Now that Mitt Romney appears to be the frontrunner for the Republican presidential nomination, the Obama-loving media are out in full force attacking him. Occupy Wall Street attacks income inequality and the richest 1 percent, adopting as its slogan ''we are the 99 percent.'' In October, its protesters staged a ''millionaires march' 'in New York City, parading to the homes of wealthy citizens such as Rupert Murdoch and David Koch. But only some riches bother the Occupiers, who have ignored the massive wealth of celebrities in their own ranks. The top 25 richest celebrities supporting Occupy Wall Street, according to the website Celebrity Net Worth, possess a combined net worth just over $4 billion. Greg Gutfeld on Saturday went after "hacks with an axe to grind" whose "rush to judgment" concerning last Saturday's shootings in Tucsocn "revealed the media's not so secret biases towards certain political personalities and movements." Capitalizing on the shooting in Tucson this afternoon, CBS furthered the lunatic left rhetoric that Sarah Palin was somehow responsible for this heinous crime. The theory being that the shooter was inspired by Palin’s midterm election map, which featured Gabrielle Giffords as a potential target. It’s a little concerning that CBS would fall for such a disgusting attempt to point the finger at Sarah Palin, a theory being perpetrated by liberal bloggers. But more concerning are the critics being cited in the article – commenters on Palin’s Facebook page. Impressive bit of journalism. "What a hypocrite you are. You targeted this woman - literally with a target on her district - one of your freaky Fox followers hunted her down - and now you try to distance yourself from blame." Jane Fonda has blamed Saturday's tragic shooting spree in Tucson, Arizona, on former Alaska governor Sarah Palin, conservative talk show host Glenn Beck, and the Tea Party movement. FONDA: By right wingers. There are some people who are like stuck there, you know, they're still stuck in the past. I always want to say, "Get a life," or, you know, "Read what really happened," you know. The myths are now true. Referring to people who sometimes protest against her, she continued: "But it makes me sad for these people who are stuck because they've not taken the time – if they're going to waste their energy on hatred, they should take the time in finding out what was really true." Although some in the liberal media were all too eager to point out instances where some are celebrating President Barack Obama's "epic fail" in the media, it was just a matter of time before conservatives and Republicans got the blame for the President's inability to secure the 2016 Olympics for Chicago. Tuesday’s The O’Reilly Factor on FNC showed a pre-recorded interview with CNN founder Ted Turner, in which O’Reilly got Turner to admit that he and Jane Fonda, who both opposed America’s involvement in the Vietnam War, had ignored the slaughter of millions by the Khmer Rouge communists in Southeast Asia after America’s withdrawal from the region. Turner: "You got me. I didn’t really think about it. You know, it didn’t make the news very much at the time." The CNN founder, who was appearing to promote his biography, "Call Me Ted," readily admitted to "admiring" Cuban dictator Fidel Castro, and expressed doubt when O’Reilly argued that Castro had murdered many people. Turner: "Well, I admire certain things about him. He’s trained a lot of doctors, and they’ve got one of the best educational systems in the developing world, and, you know, he’s still popular with a lot of people down there. He’s unpopular with a lot of people, too." After O’Reilly injected, "But he’s a killer. 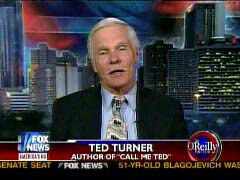 He’s a killer," Turner responded: "He’s not, that has never, to my knowledge, that’s never been proven." But Turner only reluctantly praised President Bush after O’Reilly argued that Bush "has saved more lives, sent more money, and provided more medical care for the citizens of all the countries of Africa than any human being that’s ever lived." Turner: "I think he made a lot of mistakes, too, but you can’t, he did some good things, but I think you basically, he’s got a good heart."